We carry a full line of quality dog and cat foods as well as most everything you need to make your pet happy. Crates: We carry both wire and soft sided crates (Precision, Midwest, Guardian Gear, Pet Gear, etc.) We also have carriers for small and toy breeds and exercise pens in all sizes. Collars/Leads: We carry Lupine collars and leads as well as Herm Sprenger metal collars, show collars and leads and fully braided leather leads. Strollers: We have several dog strollers available. Some convert three ways from a stroller to a carrier to a car seat. Books: We carry a variety of breed and training books. Clothing: We carry Muck Boots for you, as well as dog coats and boots. Treats: Brands include Red Barn, Jones, & Nutri Source. 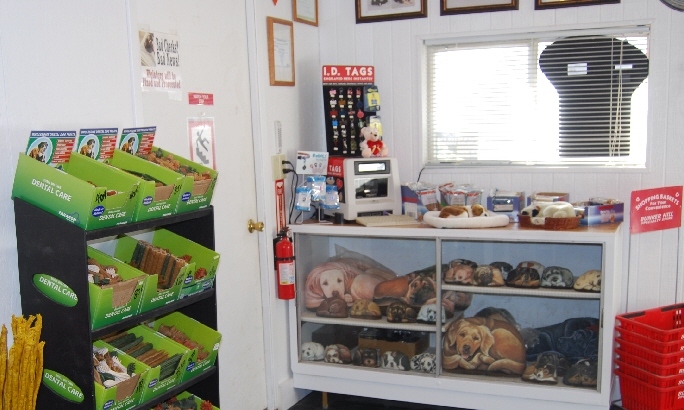 We have soft treats, freeze dried treats, bones, etc. Toys: Our toys include soft plush, latex, tug toys, Babble Balls, Jolly Balls, tennis balls, Kong toys and squeaker Kong toys, etc. Grooming Supplies: Whether you want to trim your dogs nails or get ready for the big show, we have the products you are looking for here. We carry a full supply of Bio Groom Products from shampoos, to flea treatments to chalk. We have brushes, rakes, combs, nail trimmers, flea prevention products (Adams, Bio-Spot, Liberty 50, etc.) scissors, clippers, trimmers, grooming gear bags, etc. Training Equipment: Our training equipment is geared for the competitor as well as the family pet trainer. We carry retrieving dumbbells, correction tabs, tracking leads, some utility articles, utility gloves, shark lines, treats, treat bags, training bags, clean up bags, etc. We also have play agility sets and some agility equipment such as lightweight tunnels and jumps. Collars include all of the collars listed above as well as spray/citronella collars, barking collars and e-collars. WE NOW CARRY THUNDER SHIRTS! Gift and Breed Specific Items: We sell mugs, breed specific license plates, cookie jars, sugar bowls, door mats, car mats, statues, jewelry, pupperweights, euro stickers, key chains, etc. Miscellaneous: We also carry cat toys, cat collars and leads, ssccat spray repellents for pets, etc. Special Order Items: We will special order items, at our discretion, for customers with 100% of fees paid up front at the time of order. No refunds on special order merchandise unless damaged or unavailable. Orders must be claimed by customer within 30 days of receipt of item(s) at store. Our store does not sell animals. Visit a reputable breeder with health guarantees for registered, purebred dogs/cats or your local shelter for mixed breed or unregistered purebred dogs/cats. Do not support puppy mills! Dog and Cat Foods, Dental, Ear and Eye Care Products, etc. Cookie Jars, Mugs and many gift items available.